Toyota is launching electric vehicles and fuel cell initiatives for passenger cars and commercial vehicles to meet China’s electrification targets. Toyota will be rolling out an electric vehicle under the Toyota brand in the Chinese market in 2020, and that the scope of a fuel-cell vehicle feasibility study will be expanded to cover commercial vehicles such as buses. For years, Toyota has developed China-made hybrid units and expects to sell a total of approximately 100,000 units of the Corolla Hybrid and Levin Hybrid models in 2017, both of which feature domestically-produced hybrid units. In addition, development of plug-in hybrid variants of the Corolla and Levin is underway in preparation for their rollout. “We will use the technology we have nurtured in hybrid electrification to carry out extensive development of new energy vehicles as required by China,” said Senior Managing Officer and CEO of the China Region, Hiroji Onishi. 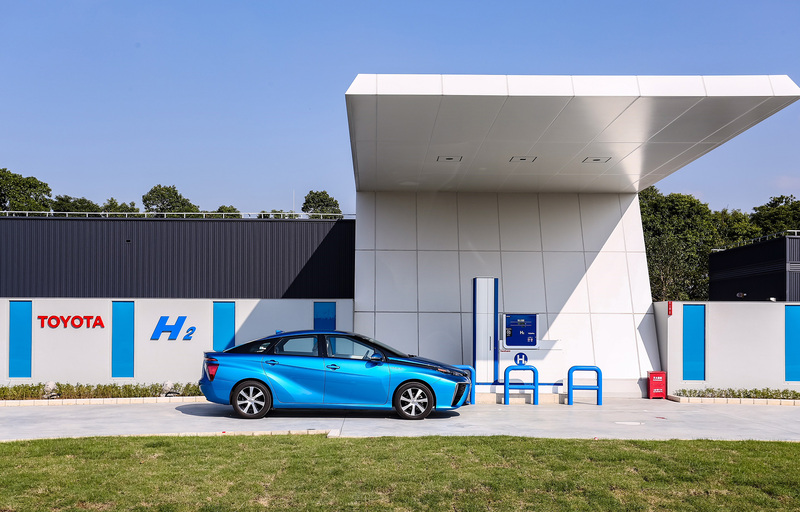 Recently, the TMEC (Toyota Motor Engineering & Manufacturing (China) Co) Hydrogen Station has been completed for fuel cell vehicles, and verification is being carried out under a three-year plan from October using two Mirai vehicles. Toyota will also study and evaluate the feasibility of using commercial vehicles, such as buses, in China to explore the potential usage of fuel cell technology. Fuel cell buses have already been introduced in Japan and a feasibility study on potential usage of fuel cell technology in heavy-duty trucks in the USA are ongoing. Toyota is also proceeding with demonstration tests of fuel-cell vehicles with Mirai in countries such as Australia, the UAE and Canada. Ultimately, Toyota aims to achieve a hydrogen-based society through verification under a range of environments. Also at Auto Guangzhou 2017, Toyota announced the rollout of a second TNGA (Toyota New Global Architecture) vehicle in the middle of next year―a compact SUV (known as the IZOA, or C-HR) fitted with a newly developed 2.0-litre TNGA engine―following the launch of the Camry in China, the first vehicle developed using TNGA.